In the modern era of baseball, we are constantly in awe of the tremendous stuff that major league pitchers are bringing to the mound night in and night out. At the same time teams are putting a greater emphasis on hitting the ball out of the park because it is becoming ever more difficult to string a few hits together to put runs up on the board. As a result of that we sometimes get games like the one today between the Twins and Brewers. As you can probably tell from that intro, if you didn’t get a chance to watch today’s game you really didn’t miss much. The two pitching staffs combined to strike out 29 batters while surrendering only six hits. 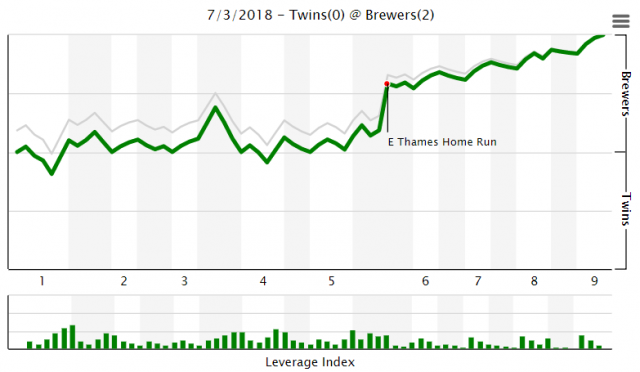 In what is the same old story that we have been telling all year, with the exception of Eddie Rosario and Eduardo Escobar the Twins offense was completely nonexistent. 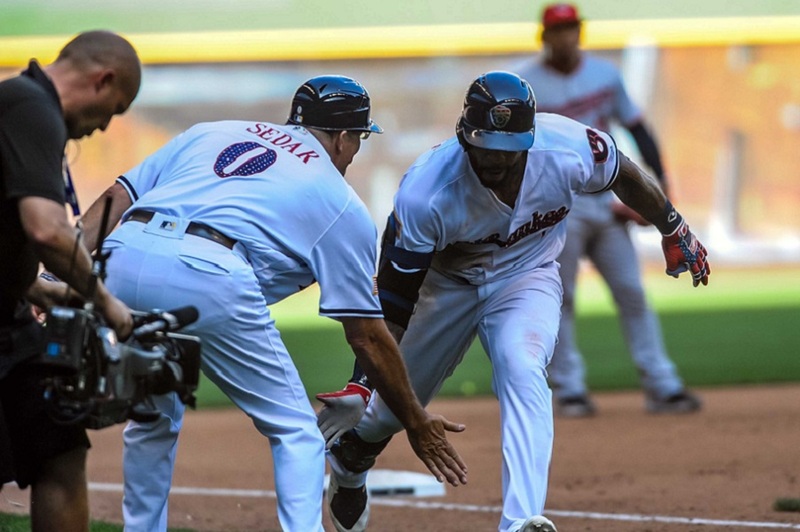 The only two times a Twin not named Rosario or Escobar reached base were on a first inning double by Jorge Polanco and a fourth inning walk from Max Kepler. Jake Odorizzi had another one of his patented five inning outings. In each of his 18 outings so far this year, Odorizzi has yet to pitch more than six innings. This biggest reason for that is the 19.3 pitches per inning that he is averaging this year, which leads all qualified starting pitchers by nearly a pitch per inning. The lone runs in the game came on a two-run home run from Brewers outfielder Eric Thames in the bottom of the fifth. If there is one bright spot the Twins can take away from today’s game, it is the performances from Ryan Pressly and Gabriel Moya (who was called up today). The two combined to throw three perfect innings in relief, striking out seven of the nine batters that they faced. The run for 100 losses is back on! Real disappointment this season. After last season, I was expecting to look forward to several or more years of Rosario, Buxton and Kep playing together and getting more potent year over year in the outfield. Looks like that doesn’t happen. I see one or more of them gone soon. At least that looks like a starting four. You forgot the "boy" on the end of that post. Josh Hader threw three innings. I've said that every team should be trying to acquire or at least creating their own version of Andrew Miller. The Brewers have created one. Time for the bag on the head. When the new baseball strategies developed making a K unimportant the Twins did not get the message that if the K is unimportant it is because the batter will potentially hit a HR the next AB.HAHAHA............. This team strikes out because it can't hit the baseball.The opposing pitcher looks like Cy Young or Sandy Koufax, but believe me - he is not. As long as you stay away from Joe's, the rest of the team could surely use one. I have yet to understand the Kennys Vargas love. He has a .677 OPS at AAA this year. He is simply not very good. The Brewers have more than one. At least 2 maybe 3 dominant relievers. Jeffress has a better ERA than Hader. Well the Brewers have 5 relievers having better ERA than its closer. The closer's ERA is 3.05 and he struck out the side in the 9th today. This is a monster bullpen. You have to give the credit when it's due. The Brewers has a monster bullpen. It's the best in the major league. Today's starter is its best starter with an ERA of 2.87. Hader is going to the All Star game this year. Their closer is a shutdown closer. Was their closer an All Star last year? I believe the Twins will see Jeffress tomorrow if it's a close game. Another dominant reliever who is going to the All Star game this year. Absolutely agreed, Vargas isn't hitting at AAA, so why would he hit better against major league pitching? The DH solution isn't in the current organization, but I would be fine if Morrison was DFA'd. Morrison has been worse. Vargas is still relatively young. I believe Vargas can at least hit over .200 in the major league. Along with power, speed, defense, depth and farm help a phone call away... all inside a 98 million dollar payroll. This Stearn guy is a GM who can GM. How can the Royals possibly be 11 games worse than the Twins? If biblically bad baseball is your thing, KC and Baltimore could challenge Detroit's modern day record of 119 losses set in 2003... Should be exciting! Only TWO GAMES OUT of the the 3rd pick in next year's draft! And the monsters can go multiple innings, so- you don't burn out your pen- or get caught in a bind like Sunday- as Molitor so often does by situationalizing everything. Instead of a "boy" on the back end, maybe he forgot an "Uh" on the front end? I feel like the Twins might not win another game this season. Being a fan of this team feels like being a blackjack addict getting dealt 16 every hand. Just no real chance at all to win, and even those small number of times you get lucky, the dealer's showing an ace. You play one more hand because maybe THIS time you'll win. Kick yourself, repeat. Happy 4th!I'm taking a flight back to Minnesota today, all the way from Guatemala. I'm going to pack my winter jacket - I've got a 4-hour layover inside the Miami Airport, after all. They missed a 4 foot putt on 18 to be 10 games worse.